Welcome to another Modern Musings! It's been a while since I have done one of these set reviews but having a reinvigorated enthusiasm for the game I felt motivated to do a new article. 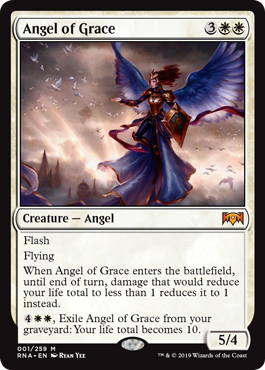 An interesting play on Angel's Grace , which is of course a staple of Ad Nauseam decks. Angel of Grace is a strong threat that can be cast at instant-speed to boot and can save your life if necessary. Combined with Eldrazi Displacer or other blink effects you can prevent yourself from ever dying in a soft-lock. The ability to exile it from your graveyard to set your life total at 10 is another way in which it can rejuvenate you. Putting Angel's Grace on what is a considerable stick is quite interesting. It could give Ad Nauseam decks another angle of attack or maybe give Eldrazi & Taxes a way of locking down games. Quite a bit of potential with this card. 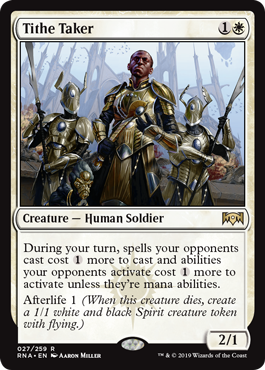 Hero of Precinct One is a 2-mana human who can make more human tokens. 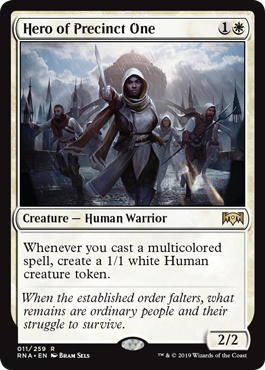 This could be very powerful in the Five-Colour Humans deck as the tokens generated trigger Champion of the Parish and Thalia's Lieutenant and can be pumped by Thalia's Lieutenant and Mayor of Avabruck . However, there are a few issues. The first is that current Humans decks run a decent number of multi-coloured creatures, such as Meddling Mage and Mantis Rider, but perhaps not enough to make Hero a great play every game. The second issue is that Humans is an AEther Vial deck and vialing in creatures does not count as casting them so you do not trigger Hero's ability by vialing in a multi-coloured creature. 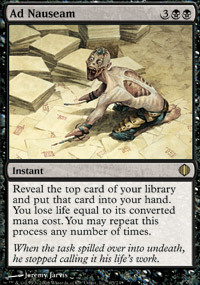 This card feels like it fits in Death & Taxes, however, I think ultimately it just isn't taxing enough. Only punishing opponents for playing at instant speed is generally not good enough. Though probably generally better than Grand Abolisher , particularly thanks to having Afterlife, I think the tax is too easy to play around to be more than just a bit irritating. Pteramander could actually be a really powerful one drop if it's adapt ability wasn't quite so expensive. 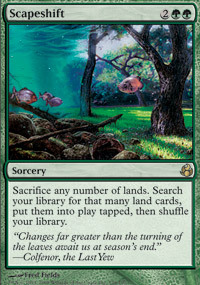 Dumping cards rapidly into the graveyard is a Modern specialty but getting 6 or 7 instants and/or sorceries into the graveyard, rather than just cards generally (as in the case of Delve), may be a tall task even in Modern. It is probably work testing as it could be better than Delver of Secrets if you can reach a cheap adapt rapidly but I fear it's slightly priced itself out of playability. Cards like these are always quite interesting. Getting a pre-game advantage is interesting and perhaps there will be a combo deck that can really abuse that Scry 3 some day. 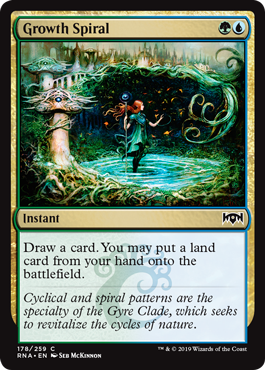 This card probably isn't Modern playable but there are certainly a lot of cool combinations you can use with Verity Circle. Narcolepsy allows you to draw a card each turn from tapping the enchanted creature. 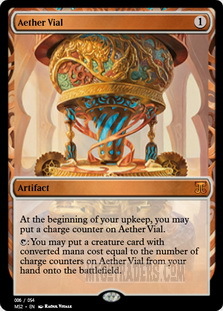 I guess Verity Circle would probably work best in some sort of enchantment prison deck. 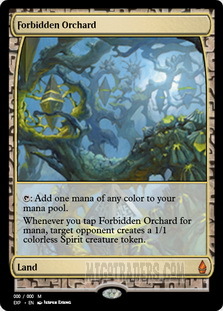 You could even play Forbidden Orchard to force creatures on your opponent for you to draw cards off. Probably more casual fun than constructed but a very fun build-around card. There really is not much in the way of exciting black cards I am afraid. 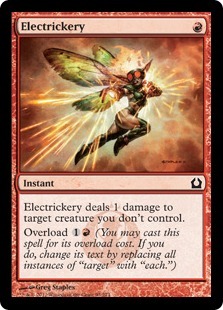 This card is an interesting an makes a card like Electrickery a Plague Wind . Not strong enough for Modern though. 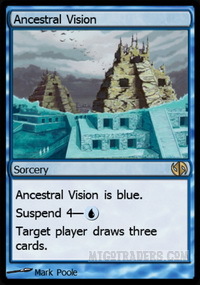 This is the card that seems to have got Modern players most excited. 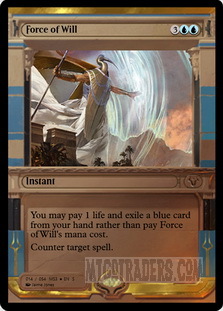 Being able to cast free spells always has a risk of being broken and in Modern we have the no cost suspend cards that particularly benefit from these type of abilities. 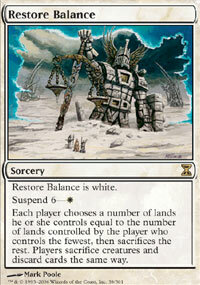 The cards we are probably looking to cast off Electrodominance are Living End , Restore Balance or Ancestral Vision . It's important to note that putting Electrodominance into the deck does mean that Cascading into the combo is a bit more of a problem as you may hit an Electrodominance which will not work unless you have a suspend card in hand ready to cast. That's right! 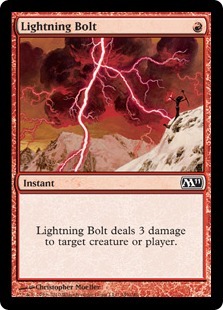 For some reason they have decided to print another Lightning Bolt style burn spell in Standard. 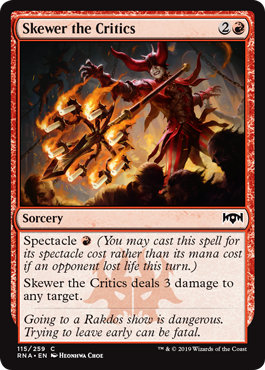 Skewer the Critics also happens to be a lot less restrictive than Wizard's Retort in that all you need to do is deal damage to an opponent to get the discounted cost. It is also important to note that Skewer is sorcery speed but it seems most likely that it will find a home in Burn/RDW where that is not likely to matter so much. I imagine most of the time Skewer will just be better than Lava Spike as having the option to hit a creature when necessary can be pretty valuable and there is rarely a turn where Burn isn't dealing damage to the opponent in one form or another. 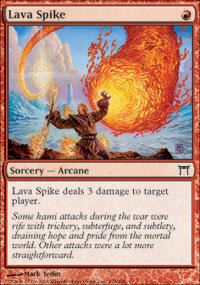 Even if you do end up casting Skewer the hard way at 3-mana it's still a fairly good rate for a burn spell. 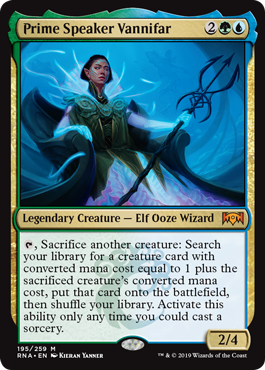 If the hard casting cost for this was 4-mana it might have been a slightly tougher sell but as it stands this package seems like a great deal. 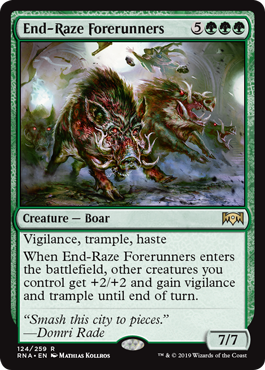 End-Raze Forerunners is on a similar level to Craterhoof Behemoth in terms of powerful extreme top-end green threats. Craterhoof sees some play as a top-end game winner for Elves. Craterhoof is probably better in most circumstances though unless for some reason vigilance is important. Absorb is a reprint from Invasion which now brings the card into Modern playability. 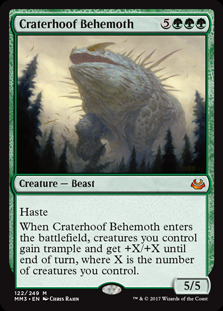 Interestingly, its counterpart Undermine has not seen a reprint. 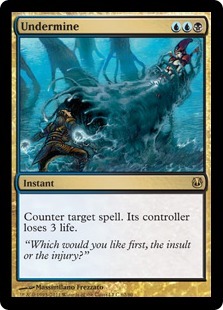 Absorb is a counterspell with upside and the lifegain could be relevant in what seems like an increasingly aggro-centric Modern format. An interesting new removal spell though with a slightly restrictive cost. 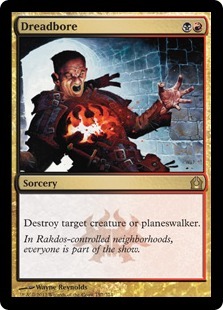 Bedevil is very versatile and will rarely be a dead card with the ability to hit artifacts, creatures and planeswalkers. 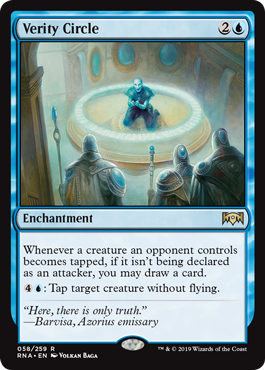 Dreadbore has seen some play in Modern because of its ability to kill planeswalkers like Teferi and Jace, TMS. 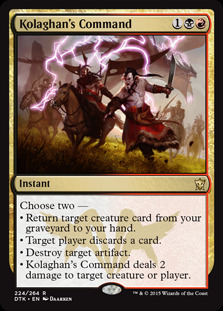 The problem in Modern is that 3-mana is a lot and Bedevil has competition from cards like Kolaghan's Command which is probably better in most decks that want it. I imagine Bedevil will see play but it seems like it will be a 1-of or 2-of type card with maybe some copies in the sideboard. That said, in the right deck, I could see wanting to run a playset just for the level of versatility it brings over other removal spells. A pretty solid hate card against various decks in Modern. 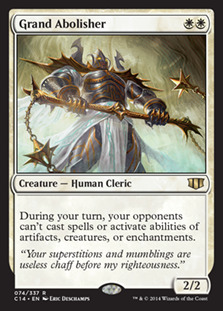 It's a Naturalize with a nice added hate-effect in pinging opponents every time they cast a spell. 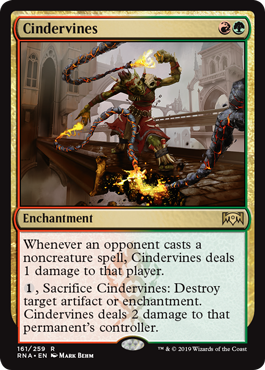 As the ability on impacts opponents it means you can splash this in Burn sideboard or similar circumstances to deal a substantial amount of damage to creature-light decks. 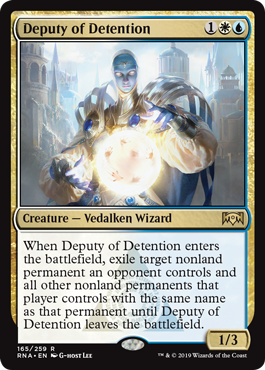 Deputy of Detention is a Detention Sphere on a stick, which is pretty good really though obvious easier to remove than the enchantment. 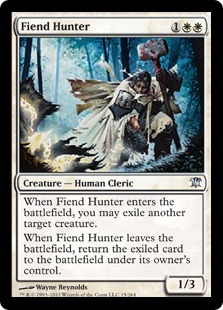 With a 1/3 body this is substantially better than Fiend Hunter , which is a pretty solid card in itself. In terms of creature types Wizard can be a relevant type. 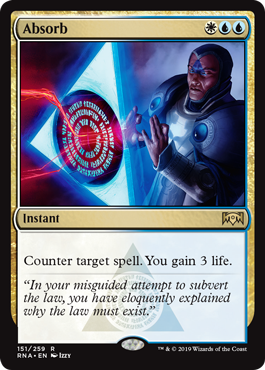 The fact it isn't a Human though does mean it's probably not going to see Reflector Mage out of decks that want it, however, Wizard's Retort does make Wizard a relevant creature type. 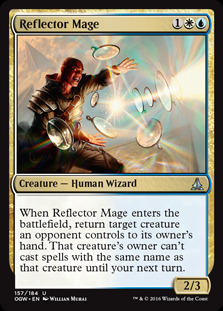 Reflector Mage is probably a good comparison in terms of power level. 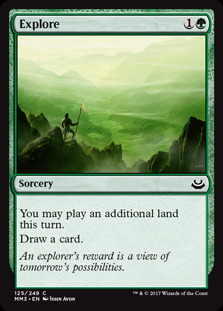 An instant-speed Explore is an interesting prospect. 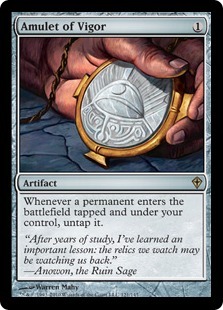 The main decks that might want this are Scapeshift and potential Amulet of Vigor combo decks. 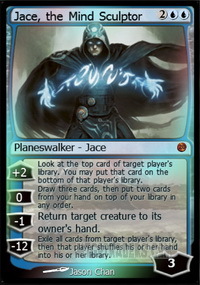 There are already some blue version of the Scapeshift deck that run Jace, the Mind Sculptor and sometimes Bring to Light too. Not a card I first thought about for Modern playability but it is another Human and one that has a powerful pump effect. 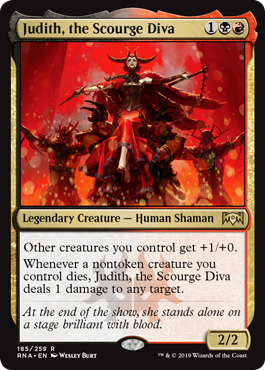 Additionally Judith can deal additional damage in the event that one of your creatures is killed. I feel that Humans probably has better options but Judith is worthy of some consideration. Lavinia is a really interesting hatebear and quite an original design. It is strong against decks like Tron and other mana-ramp strategies. 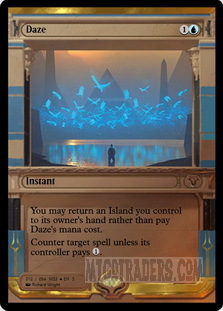 It prevents cascade and also counters 0-cost spells like Mox Opal and Pacts. I think the frustrating thing is all the cards that slip through the net. Arclight Phoenix returns from the graveyard and isn't cast, creatures put into play with AEther Vial aren't cast either and copies of Storm spells aren't cast either. 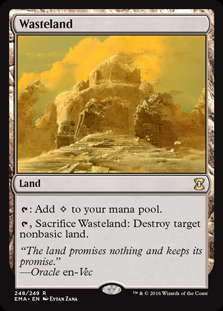 As such Lavinia seems like it will be more effective in Legacy and Vintage than in Modern, where it hits Force of Will , Daze , Moxes and mana-denial through cards like Wasteland is much more effective. 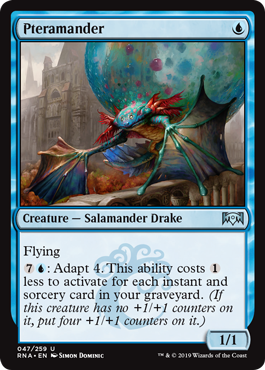 Another in the slightly disappointing trend of reprint old cards on a creature (are Wizards really this low on ideas), is the rather exciting Birthing Pod on a stick Prime Speaker Vannifar. Birthing Pod decks were much beloved before it got hit with a ban. Pod was extremely powerful and allowed a number of very powerful creature-based combos but was also just able to win from value plays and creature beatdown. Prime Speaker Vannifar does a decent impression of Birthing Pod and as a 2/4 is not as vulnerable as it otherwise might be. 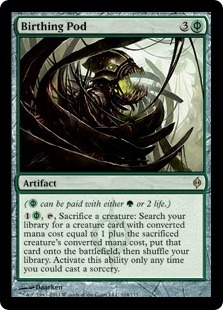 However, importantly it's roughly two turns slower than Birthing Pod which was often cast for 3-mana and as an artifact does not have summoning sickness. On the positive side, Prime Speaker does not have an activation cost but little to mitigate that fact it is substantially slower than the card is impersonating. There are ways to mitigate the drawbacks. 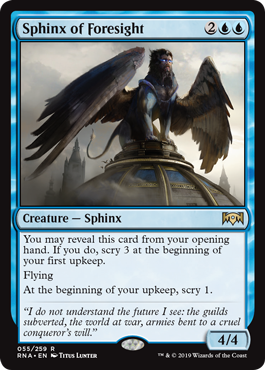 Chord of Calling can put Prime Speaker into play at instant-speed to allow you to untap and activate Prime Speaker Vannifar on your turn. You can also use ways to give it haste, like Rhythm of the Wild below, to make it quicker. A fun enchantment, preventing control decks from countering your creatures. It also grants those creatures Riot, the latest Gruul mechanic. Riot allows the creature to be given a +1/+1 counter or to be given haste. 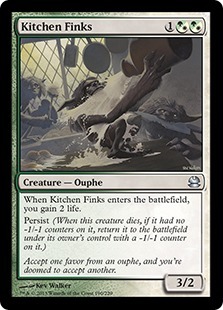 It combos with Persist creatures, like Kitchen Finks , meaning that they can return indefinitely and can be sacrificed and returned to the battlefield infinitely with a suitable sacrifice outlet. 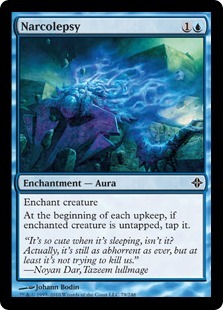 This combo is nothing new, being a staple of Birthing Pod decks back in the day, and has lived on in Creature Toolbox decks which seems like where this card is most likely to shine. 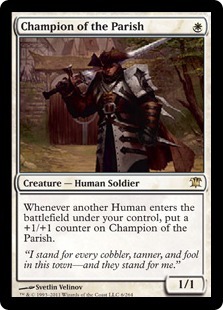 It also combos with creatures with activated abilities that require them to tap. Perhaps most interestingly and topically, it can give Prime Speaker Vannifar (above) haste to allow it to do a much better impression of Birthing Pod . It's not a terribly exciting card but it is a cheap burn spell that has advantages over some of the other available options. 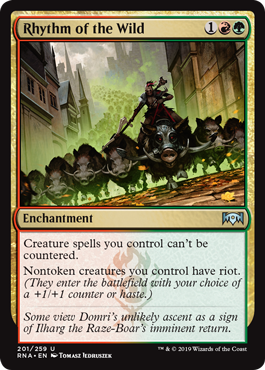 I think Skewer will be making its way into the main deck of Burn decks moving forward. 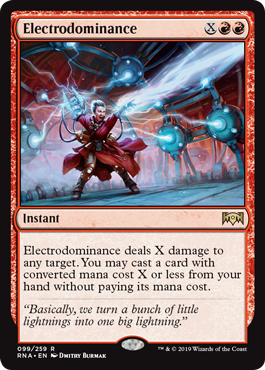 Electrodominance is an interesting card that will no doubt revive interest in the Suspend cards, such as Living End and Restore Balance . 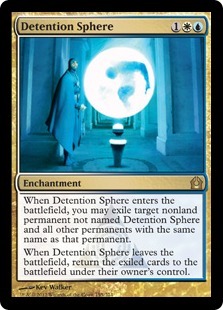 A Detention Sphere on a creature. It's pretty strong and follows in the footsteps of cards like Spell Queller and Reflector Mage, however, it is also vying for similar slots. 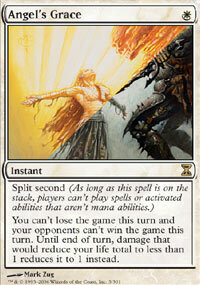 A powerful removal spell that is very versatile. At 3-mana it's on the expensive side for Modern removal but instant-speed removal for artifacts, creatures or planeswalkers is pretty nice. 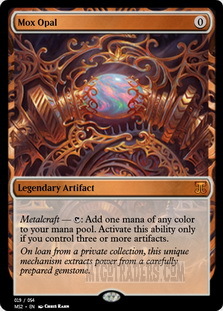 The new version of Birthing Pod is an interesting card and one that is worthy of some attention. I have my doubts about how good it can be but it's an interesting card for Creature Toolbox decks. Could see play in UW Control as a counterspell that helps that buys additional time against aggressive decks. I'm not sure this actually changes anything for Creature Toolbox decks but it seems an interesting card to mess around with it. A powerful creature with a strong ability. It might be too expensive to have a big impact on the format but it makes for some new and interesting options. I always enjoy getting new toys for Modern. 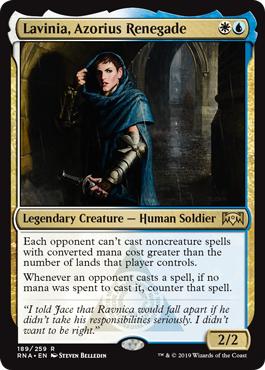 I think there are some fun options in Ravnica Allegiances but nothing that seems like it will have a major impact on the existing top archetypes in the format. Burn gets a new toy which I think will see play and there are some other nice roleplayers but nothing that seems like it will be a major player in the format.